Complete athlete preparation is achieved as we train in four main areas. These are physical, tactical, technical, and mental preparation. Too often, mental preparation is overlooked despite the fact it controls the other three. This app is the solution and can bring performance to a whole new level. MTOUGH provides you with a sport psychology program to improve your mental toughness. Mental toughness is how we manage our emotions, attitudes, and behaviours. This has an incredible impact on sport performance. 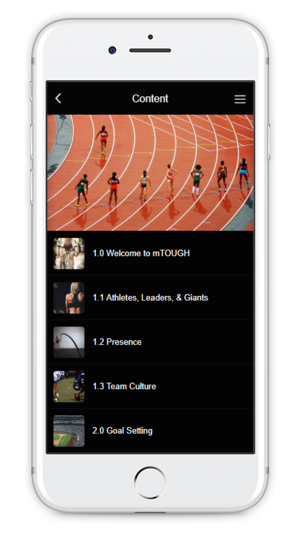 The mTOUGH program has been crafted specifically for the millennial athlete who wishes to achieve full potential. The mTOUGH app is a one-time purchase with no advertisements or pop ups. It contains all of the summary articles on over 30 mental toughness topics to help the athlete perform with precision and consistency, regardless if they are involved in a team or individual sport. The mTOUGH program follows a weekly curriculum of mental skill development that introduces a new skill each week for compounding success. The new skill is outlined in a summary and then push notifications are sent to the athlete as gentle reminders to employ the skill in practice, games, and everyday life. It is the program sequence and regular reinforcement that allows the skills to become refined and bulletproof. Just like a quarterback throwing a ball, mental skills need reps too! The entire package is on the smartphone and viewable anytime-anywhere. Athletes can review on their own schedule, before games, after games, on the bus and more. Further, if you want to subscribe to the video component, you can watch a fresh 5 minute video each weekend on the new topic. 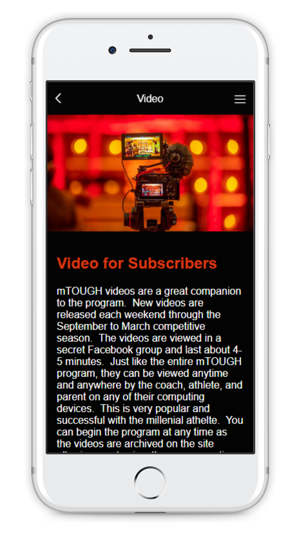 In addition, video subscribers can connect directly with the author, a veteran international coach of multiple sports, for a personalized program. The author is an NCCP Level 5 Canadian Coach with experience ranging from grass roots to Olympians. He is an expert in strength & conditioning, speed development, nutrition, biomechanics and more. He understands complete athlete preparation and how mental preparation fits in. The mTOUGH program currently has clients in Canada, USA, Europe and the Caribbean and the list is growing. 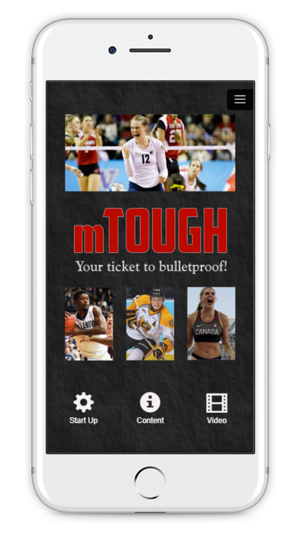 The subscribers include high school athletes, U Sports athletes, NCAA athletes, professional athletes, and more. Further, it works for dancers, actors, lawyers, teachers, CEO’s, and anyone else who needs to perform at their best under pressure. This works!